Moulded soakwells provide an underground tank for water collection allowing it to seep away into the soil without causing damage to the surrounding areas. Our concrete soakwells range in capacity and size, the smallest being 381 L and the largest being 2650 L. Made with concrete that has been tested to ensure product quality by licensed testers, this product satisfies Australian Standard 1012. All soakwells have been reinforced using 4 mm steel mesh cages in accordance with AS/NZ 4671, and are made by hand in Western Australia. 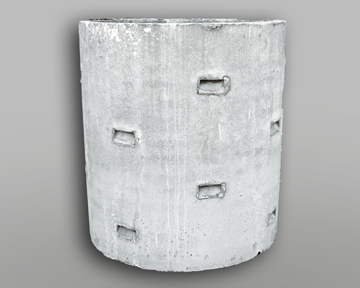 Concrete products are not kept on site so please be aware there is additional $80.00 delivery costs for picking up any concrete products from us in Welshpool, or we can quote on delivery as far as Mandurah, Yanchep and Mundaring. Correct lifting jig and procedure must be used for installation and transportation.